Adaptive air suspension and, for 2018, Airscarf neck-warming make the Mercedes-Benz S-Class Cabrio the ultimate luxury convertible. 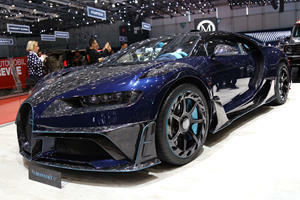 Power is derived from a bi-turbo 4.7-liter V8, developing 449hp and 516 lb-ft of torque. A 9-speed automatic transmission is the only option, sending power to the rear wheels only. An optional Sport package adds Sport body styling, aluminum pedals, and 19-inch AMG alloy wheels. Available safety features include active lane keeping assistant, blind spot monitoring, and rear-cross traffic alert. When it comes to the uber-luxurious open-top experience, the now outdated BMW 6 Series Convertible just won’t cut it. But a Rolls-Royce or Bentley is more often than not overkill. There’s just one option, then – the Mercedes-Benz S Class Cabriolet. Aside from the two AMG variants – dealt with in another review – the S-Class Cabriolet can be had in just one model – a V8 powered S550. Based on the coupe, the soft-top convertible adds 112 pounds to the overall weight, and reduces cargo volume, but retains the same engine and transmission. In a class of one, there’s still place for excellence. Though all Mercedes-Benz models may imitate the design of the S Class’s interior, none of them have the quality of this halo model cabriolet. Rich leathers adorn the soft-touch dashboard, whilst sculpted seats feature rich soft-grain Nappa leather upholstery. For 2018, AIRSCARF neck-warmers are a new feature. Dual-zone climate control and soft-close doors are both standard and add to the luxuriant feel of the cabin. Despite the air of class and grace, technophiles aren’t excluded – the standard dual 12.3-inch screen setup incorporates Apple CarPlay and Android Auto functionality, but lacks touch control. The cabin offers comfortable accommodation for 4 in comfort. Even the retractable roof doesn’t impede cabin room too much. With the roof closed, 12.4 cubic feet of cargo space are available – more than in the coupe – though with the roof down that shrinks to 8.8 cubic feet. The soft-top roof also offers exceptional noise buffering and insulation properties when closed. 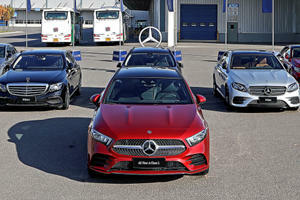 In S550 guise, devoid of AMG-tuned suspension, the S-Class Cabrio focuses primarily on comfort. Airmatic semi-adaptive suspension is standard with electronically adjustable air springs that adapt based on driving mode and driving style. In Comfort mode, the ride is too cushy and boat-like – porpoising over bumps and pitching and rolling under braking and cornering. Though the S-Class is oft referred to as a land-yacht, the S550 Cabrio behaves like one on the open seas. However despite the floatiness, the standard 19-inch alloys and low-profile tires send shunts through the cabin over larger bumps, and the secondary ride is often jittery. Sport mode offers a far better ride – tightening the ride into a more cohesive one, and sharpening the steering for a more intuitive drive, but without a severe compromise on the overall comfort. The loss of such a large portion of roof does however increase body-flex, and rob it of any performance pretenses it may have. 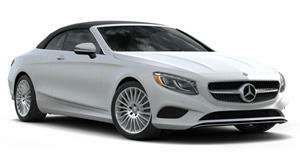 Unlike the coupe that features 4MATIC all-wheel drive, the Mercedes-Benz S550 Cabrio is rear-wheel drive only. Under the hood lies the M278 engine, a 4.7-liter bi-turbo V8 with outputs of 449 horsepower and 516 lb-ft of torque. 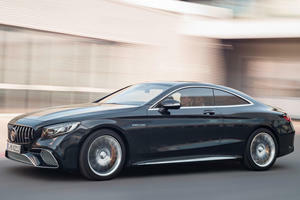 A manual gearbox would rob the S-Class Cabrio of its smoothness, so the S550 makes do with a 9-speed automatic. Despite the comfort bias, the S550 Cabrio is no slouch though – racking up 0-60mph in a spritely 4.6 seconds, whilst a standard sports exhaust system provides an almost-AMG soundtrack to the experience. 16-way power adjustable heated and ventilated seats and a Burmeister sound system are just the tip of a highly luxurious iceberg. The Premium Package adds, massaging front seats, a heads-up display, and a surround view camera, but the S550 Cabrio can also be equipped with a heated steering wheel and heated rear seats as well as heated front armrests. To aid safety, the optional Driver Assistance Package incorporates speed limit assist, active lane keeping assist, blind spot monitoring, autonomous emergency braking, and cross-traffic assist. The usual ABS brakes, stability control, and airbags also feature. Forget notions of performance, the Mercedes-Benz S-Class Cabriolet is pure luxury. With such levels of comfort and extravagance, it questions the need for anything from Rolls-Royce or Bentley. Until such time as the BMW 8 Series arrives, this really is as good as it gets. Only a new S-Class sedan is due in 2020. Are We About To See A Mercedes O-Class? Patent application suggests something new's in the works.